The two most important tools that a scrapper can have in his arsenal is a magnet and the ability to know the difference between various types of metal. If you are just getting started in scrapping in Massachusetts – either to earn extra cash or to start up a business – it is important to learn about the different types of ferrous and non-ferrous metals that you will come across in your travels. Some metals are worth more than others and if you know what to look for, your chances of bringing in a big haul to your local scrap metal recycling facility will greatly increase. As you are learning the trade, your magnet will quickly become your best friend. The first step in determining whether you have found ferrous or non-ferrous metals is to use your magnet. If the magnet sticks to the metal then you have a ferrous metal. Ferrous metals are “common” metals, such as iron or steel. Compared to non-ferrous metals, ferrous metals are not worth very much at the local scrap metal recycling facility. However, these metals are often found in bulk quantities and are accepted at your local scrap yard. If the magnet does not stick to your metal then you have found a non-ferrous metal. There are many “common” metals that are identified as non-ferrous, including stainless steel, bronze, copper, brass and aluminum. While still considered to be “common,” these metals will fetch you a lot more at the local scrap metal recycling facility than iron or steel. Other non-ferrous metals include precious metals, such as gold, silver and platinum, as well as exotic or rare metals, such as tungsten, beryllium, cobalt, mercury and selenium. Sometimes identifying a specific type of metal is as easy as knowing what to look for. Color is a great identifying factor, however knowledge of the qualities of that metal, such as whether or not it can rust or where it can be found, are also helpful. The longer you work at scrapping in Massachusetts, the more you’ll be able to spot out these valuable metals to maximize your daily profit. This type of non-ferrous metal is used very commonly within the structure of homes. Remodeling projects, demolitions and other construction sites will typically have copper electrical wire or pipe that they have removed from the structure. It can also be found in roofing materials, gutters and on the inside of air conditioning units. Because copper is so valuable, it has attracted the attention of unsavory opportunists who steal new and used copper from these locations. 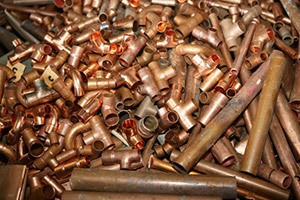 Your best bet for locating this metal is to contact construction companies, contractors, plumbers and other individuals who work in these industries and make a deal to collect their copper remnants for scrap. While some see the benefit in recycling these items themselves to recoup some extra money on the job, others simply don’t have time and would appreciate working with someone who could take the copper and other metals off their hands. Good Condition: reddish and “coppery” in color. Used Condition: color can be worn or faded with darker brown areas and greenish rusted areas. This type of non-ferrous metal is the #1 most recycled metal in America, due in large part to the campaign that was waged to encourage recycling of aluminum cans. In addition to cans, aluminum is also found in a lot of other locations. On the job site, it can be found in remodeling or demolition projects that include siding, frames for doors and windows, gutters and many other places throughout the home. Because it is so light in weight, aluminum is typically brought to the local scrap yard in bulk quantities in order to maximize the profit of the haul. Again, your best bet is to work with contractors, designers and other folks in the construction industries and try to create a partnership that will give you access to discarded metals for scrap. Scrapping in Massachusetts can be quite profitable if you know where to look and are able to make deals with people who work with these metals each and every day. A combination of two other non-ferrous metals, copper and zinc, brass is worth more than ferrous metals, but is not as valuable as most other non-ferrous metals, like aluminum and copper. However, brass is usually very weighty and is used in hardware and other large fixtures, helping it to add up in value very quickly at the scrap metal recycling facility. You will most likely see brass in common hardware elements, including door handles and keys. It can also be found frequently in bathroom fixtures and light fixtures. Again, an alliance with a contractor or other construction-based business would benefit the scrapper that is looking for brass. One of the most common of all ferrous metals, steel can be found all over the world and in just about every place. It can be found in homes, used to make cabinets, bicycles, appliances or shelves. It is also found in automobiles, tools and other common household items. Steel can even be found in commercial, construction and industrial locations as well. Compared to other common metals, steel is not worth very much at the scrap metal recycling facility unless you are able to bring in thousands of pounds of the stuff. However, it does have value and is quite easy to collect. Recycling ferrous and non-ferrous metals, regardless of the market rate, is still beneficial to the local community and to many business owners, as it helps to reduce the amount of items going into the local landfill. If you are collecting ferrous and non-ferrous metals for scrapping in Massachusetts, it is important to find a local scrap yard that will accept all of the materials that you bring in and give you a fair, market rate. Mid-City Scrap Iron & Salvage is a family owned and operated scrap metal recycling facility located in Westport, MA. They accept a wide variety of ferrous, non-ferrous and salvage items at their facility. For more information regarding hours of operation or for any questions about bringing in scrap metals, call Mid-City toll free at 1-800-334-4789.